This week Stack Overflow shared a blog post titled Stack Overflow Isn’t Very Welcoming. It’s Time for That to Change. I admire the courage and the transparency a great deal. It takes guts to admit mistakes and serious guts to publicly air the dirty laundry. I use Stack Overflow to find answers to coding questions. I searched for me (site:stackoverflow.com “Andy Leonard”) and found some hits though I’m sure not all of them refer to me personally. Where I was raised (and still in my corner of Prince Edward County outside of Farmville Virginia), it’s rude to not speak to people. If you can’t speak because you’e driving by, you wave at people. It’s an affront to not speak to people. Not speaking is akin to denying they’re even people. Telling me I cannot say “Hi” to people in writing, on a site that exists to help people just didn’t seem right. I tried again later to answer questions at Stack Overflow. I typed “Hi <author name>” every time and then deleted it before I hit the Reply button. This sufficed for a while, but I still felt like I was being rude. You are correct and I hereby agree with you. I, in fact, have several problems. This is merely one of them. People, though, are package deals. You don’t get to converse with, or learn from, or teach pieces of people. You interact – all the time every time – with the full person. I support the effort to reduce implicit bias – at Stack Overflow and everywhere. I believe Jay when he writes earlier that it bothered him personally when some complained that they felt left out. Jay, I felt left out. Eventually, typing and then deleting my greeting to the person asking the question proved… well, just too awkward for me to continue. So I stopped answering questions at Stack Overflow. Did Stack Overflow go under without my answers to SSIS and Biml questions? Goodness, no! They’ve managed just fine without me and will continue to do so. I encourage you to disagree – and even share your disagreement in the comments. I think you’re awesome. I don’t agree with you about everything and I don’t expect you to agree with me about everything. We’re different. And that’s ok.
People editing your greetings from an answer on a help forum may not bother you at all. I’m ok with you being you. I’m actually more than ok with it. I’m even ok with you disagreeing with me on this and anything else. Regarding matters on which we disagree, I believe you have reasons for believing what you believe. I may disagree with what you believe or even why you believe it, but I don’t think you’re dumb for believing it; I believe you believe it for a reason. I wrote this because I like the Stack Overflow website. I like the help I receive from the answers I find there. Stack Overflow seems genuinely concerned with ways to improve the site. Maybe (probably) my discomfort with editing my greeting doesn’t rise higher than #3 on the list of things to change at Stack Overflow. I’m not sure and I’m ok if my little post is ignored, not seen, or if nothing changes in the Stack Overflow editing processes and practices. Promise. As I stated previously, Stack Overflow will not go under without my answers to SSIS and Biml questions and I’ll keep getting answers from Stack Overflow. I just wish I felt comfortable giving back. Nate Hindman. The article was published on the Small Business blog of an insurer, The Hartford. You can have the best people. They can be intelligent, talented individuals who know how to play nice with others. But if your culture is oppressive, their endeavors will fail. If you want to keep top talent, you cannot pay them enough to put up with your crap. You have to stop the crap. But there’s a flip side: These same individuals are also not motivated by applause at the team meeting, Employee of the Month parking spots, or Starbucks gift cards. That’s it. Training. Send them to training. They’ve self-identified as people who like to learn. Do you have a top shelf developer interested in cloud technology? Send her to Reinvent or Build. Save your Starbucks gift card money and allow someone else to park closer to the building. Send your top performers to more training. I have been told thrice in the past six weeks about great people who left their last job or are about to leave their current job because their employer killed the training budget. Is training expensive? Yes. But not as expansive as finding a new employee – let alone a new top performer. 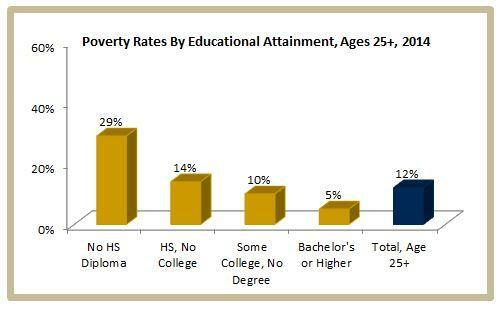 Employers, please do the math. At Enterprise Data & Analytics, we often consult remotely, but we insist on starting projects face-to-face. Why? See the quote from the article above. Email is extremely subject to interpretation. People who don’t know me may misinterpret what I write in an email – unless they’ve had an opportunity to get to know me. there’s no substitute for building rapport. There’s no other way to build trust. Both trust and rapport are best built face-to-face. A little-known fact: poor rapport with the customer team is the number one project killer. I and my team cannot be successful if we are unsuccessful at working with your team. Fortunately, I and my team are fun to work with! We are not prima donna’s, we learned because other people shared with us and one of the things we learned from the people who shared with us is: We should share with others. We love learning! I think that’s why we love sharing and helping others learn. Customers are often shocked that I consult. I have a great team working with me but yep, I still show up and deliver. I think folks get the impression that someone who’s authored / co-authored a dozen books just isn’t accessible. Nothing could be further from the truth! I help people every day! In addition to public training with Brent Ozar Unlimited and SQLSkills, I deliver customized private training to companies on-demand. How may we serve you? Let us know! Be a dependable adult. This isn’t about age. It’s about maturity. Penny Trupe is a millennial and she’s a rocking consultant at Enterprise Data & Analytics. Work hard and work smart. 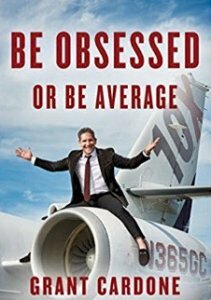 For more information, see Grant Cardone’s books The 10X Rule and Be Obsessed or Be Average. A tip o’ the hat to my Data Driven Podcast co-host and brother from another mother, Frank La Vigne (blog | @Tableteer), for turning me on to Grant. I Don’t Just Teach, I’m a Student! Monica is right. 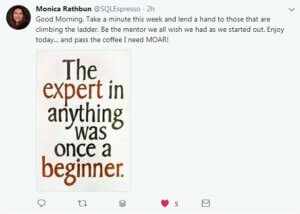 Everyone I now consider an expert was once a beginner. I’ve even witnessed some go from beginner to expert! How did that change? Education. They learned. They experimented. They read blog posts. They attended training sessions at free events like User Group meetings and SQL Saturdays. They watched videos and attended webinars and virtual group meetings. They paid for training from experts at private training companies and events like the PASS Summit. All experts were once beginners. Maybe that discourages you because you want to be an expert – or just know more – now. I get it. I promise I do. The only difference between you and the experts is: They started earlier. Many started a decade or more in the past. Maybe you had an opportunity to start before now and, for whatever reason, didn’t. If statistics are any guide, most of us have ditched our New Year’s resolutions (or will later this month). That’s ok. Make right-now goal to become a perpetual student. Make some time today to read a blog post or listen to an audio book or watch a video – or even sign up for some free training! 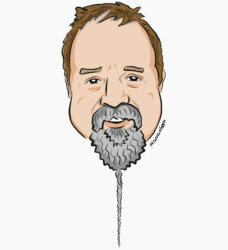 You can even follow me if you’d like: @AndyLeonard! Well, some of it is free. A surprising amount is free, in fact. 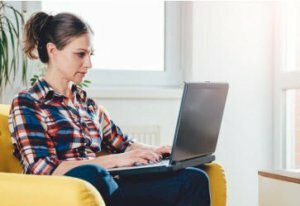 Biml Academy offers several hours of free training, for example. YouTube is chock-full of learning opportunities. The quality of training varies, but it’s difficult (not impossible, unfortunately) to complain about the quality of free training. Like Biml Academy, WintellectNOW offers a mix of free plus paid training. My friend and co-host of the Data Driven podcast, Frank La Vigne (blog | @Tableteer), authored a free course at WintellectNOW titled Data Science for Developers. edX is the site I’ve been using lately. In partnership with Microsoft Virtual Academy, edX offers Microsoft-recognized certifications. If you want the certificate, you have to pay – usually $49-$99 USD at the time of this writing. If you string together enough certifications, you complete a program. This feels a lot like leveling-up, career-wise. You can receive the education – the training, the knowledge – for free at edX. You can audit the courses! Here’s the best part: You can audit the courses today, pass them, and then purchase the certificate later. How much later? I do not know. I like this, though – a lot. Why? I get the knowledge and experience (edX labs – in my experience – are good). As a lifelong learner (which sounds so much better than “learn-aholic”), that’s really what I’m after: the knowledge. And then I can pay for the certificate later. Once you acquire knowledge you can apply it. Start applying what you’ve learned and it won’t be long before the (hiring) world beats a path to your door. Think I’m kidding about this? I added certifications to my LinkedIn profile late last year. The number of people who have viewed my profile in the last 90 days is now 2.5X what it was prior to that time. Please keep in mind that I worked on three books that were published last year. Three. Books. Nothing increased my visibility to the professional community as much as training. Training can lead to a level-up in your career. You may find a new job at a different – or at your current – employer. Free training can take you far, provided you can locate excellent free training (it’s out there but sometimes difficult to locate). You may want more focused training – training that’s more intense and takes less time. Your employer may want this too. This is when you want to invest in professional training. Where can you get such training? I’ve learned a lot at SQL Saturday and PASS Summit precons. Beyond that, you may want to attend online or in-person training, classes delivered by experienced and recognized experts. You can find this training in lots of locations. Two of my favorites are Brent Ozar Unlimited and SQLSkills. Full disclosure: I deliver Expert SSIS training for Brent Ozar Unlimited and IESSIS1: Immersion Event on Learning SQL Server Integration Services for SQLSkills. Courses – such as the training I deliver – efficiently improve your level of knowledge. How do I know? I’ve been delivering training like this for over a decade in the SQL Server space. I hear it over and over again from students: they learn a lot and appreciate the experience and knowledge. You don’t have to get training from me, but when it’s time to kick things up to the next level, please consider a focused training experience from someone. If you read MSDN Magazine, you may have noticed a familiar name at the end of Frank La Vigne’s (blog | @Tableteer) new column, Artificially Intelligent – especially the October, November, December (2017), and January 2018 articles – I’ve been helping Frank with some technical editing for his column. I’ve repeatedly shared that I enjoy learning. I’ve advised readers of this blog and those who follow me on social media to continually educate themselves. I’ve equally warned folks: If you don’t like lifelong learning, technology is not for you and you should go into another field. 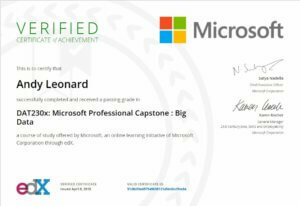 I’ve invested some time and money in more formal training via Microsoft Virtual Academy and edX (although you can take all the courses I’ve taken for free… you have to pay only if you want a certificate). Frank and I chat often. 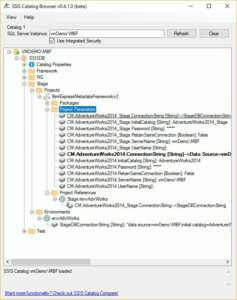 In a recent chat I shared my excitement at discovering patterns and frameworks in Apache Storm and Spark – frameworks and patterns that are remarkably similar to frameworks and patterns I’ve developed for SSIS. Why was I excited? It’s validating to me when smart people – people smart enough to build open source technology platforms like Spark and Storm – include the same functionality I’ve built for SSIS in their platforms and solutions. I’ve debated smart SSIS developers on occasion who believe frameworks in general, or specific frameworks, are not necessary. I’m not good at these debates because I can rarely remember the reason why something is a good or bad idea; I only remember that the idea is good or bad. I think the reason my brain works this way is because I’m an engineer and more interested in solving problems for customers than winning an argument… but I digress. I had a hard time remembering when to use ‘who’ and when to use ‘whom’ in English grammar until I learned German. Now I get it. I have developed patterns and utilities (such as DILM Suite) to address architectural concepts I identified as unclear or less-clear or even missing from SSIS. While it’s validating (to me) to find this same functionality built into open source platforms, the biggest thrill remains learning new stuff. As Frank and I discuss in an upcoming Data Driven show, I bring a bunch of context when learning about open source data integration solutions – and Frank brings a bunch of context when learning about the software architecture that underlies Data Science. Like Frank’s German lessons helped him with English grammar, my open source data integration training is helping me articulate arguments for frameworks and patterns – in SSIS, even. I’ve gained additional depth in my career as a result of cross-training in other data integration platforms. I’m better at SSIS because I’ve learned Spark and Storm. Bonus: I’m getting lots of experience in the Azure Data Engineering platforms. But – please trust me – I’m nowhere near leaving SSIS! In fact, I have a more lucid understanding of where SSIS excels when compared to other data integration platforms. You’re still stuck with me writing about SSIS. I hope that’s ok. I love learning! As Buck Woody (@BuckWoodyMSFT) mentioned in his post titled Don’t learn to be a Data Scientist, one should continuously learn – especially in this field. I’m happy to announce I just earned a certificate for DAT202.1x: Processing Big Data with Hadoop in Azure HDInsight! I’m slowly working my way through the Data Science Certification offered by Microsoft Virtual Academy along with edX. Although this course is not part of the official curriculum, it looked interesting – and was interesting. So I took it. Many of the courses at Microsoft Virtual Academy are free or have free options (like auditing the class). Check it out!